Perhaps they should be Part I & Part II, if for no other reason than the subject’s title from last week: Significant Sets of Twos in the Bible. Sometimes a round-about introduction can be as or more effective (entertaining) in getting to the main subject as a direct here it is approach. Whether this is one of those times … well, let’s just say it’s a direct round-about way! One thing is for sure: a one-two punch can get our attention and reach results not otherwise attainable. Although all Biblical prophecies are meaningful, those that are repeated and/or come in pairs are of paramount prominence. If God says or does something twice (over) as expressed through individuals or extraordinary events—whether for contrast, correlation, or culmination—then we need to take a long second-look at what’s taking place. Two of these sets of twos discussed in the previous post were: Birth & Rebirth of Israel & Israel—Two Exiles & Two Returns. Both related directly to Israel’s historical and contemporary interaction with Gentile nations in a twofold way: (1) Enslavement by Egypt followed by deliverance and the birth of a nation. (2) God’s discipline of his people for hundreds of years of disobedience via Gentile conquest of Israel and exile of the Jews. Not once, but twice. And not once, but twice God brought his people back to the Promised Land. The second return led to Israel’s rebirth in 1948. Until the time of Ezekiel and Daniel, we read about Israel’s glory years under King David and King Solomon, then her gradual decline after Israel split into two kingdoms. Culminating in the Babylonian conquest of Judah, destruction of Solomon’s Temple, and exile of survivors to Babylon. Ezekiel and Daniel were exiled captives in Babylon. Both were given some astounding disclosures especially concerning Gentile nations and rulers that would be coupled intricately to Israel’s immediate, intermediate, and distant future. To Ezekiel, the Lord disclosed the Gog/Magog invasion of Israel headed by nations that we can accurately identify in today’s world as Russia, Iran, and Turkey … and other weaker countries (Ezekiel 38 & 39). As demonstrated in several prior Eye of Prophecy articles, I’m convinced this attack will take place within the first year or so of the post-Rapture Tribulation. In the book of Daniel, we find two revelations regarding the four Gentile kingdoms that would set the stage for all subsequent rise and fall of nations leading directly to the end-times coalition of ten-nations plus other countries, some strong … some weak. There will also be a confederation of strong Eastern nations pitted against Antichrist’s regime, all of which will then align themselves against Israel and Messiah Jesus when he returns to rescue Israel from disaster. Fittingly, the first disclosure came through a dream of the mightiest Gentile king at the time, Nebuchadnezzar of Babylon (Daniel Chapter 2). It’s one of the most riveting prophecies of Scripture, even well-known by many unbelievers: the four-part Statue. As we know from history, these four kingdoms were: Babylon, Persia, Greece, and Rome. “It is God alone who judges; he decides who will rise and who will fall” (Psalm 75:7). 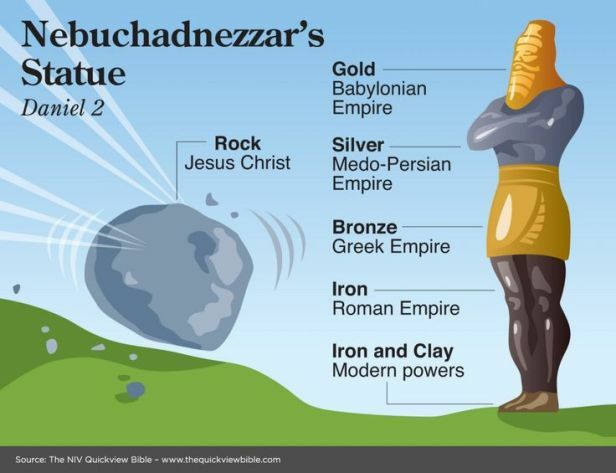 Daniel is speaking directly to Nebuchadnezzar concerning the fate of these four kingdoms and others: “As you watched, a rock was cut from a mountain, but not by human hands. It struck the feet of iron and clay, smashing them to bits. The whole statue was crushed into small pieces of iron, clay, bronze, silver, and gold. Then the wind blew them away without a trace, like chaff on a threshing floor. But the rock that knocked the statue down became a great mountain that covered the whole earth” (Daniel 2:34-35). In the demographic parameters of that which is national, political, and cultural, there’s very little left today of the Babylonian, Persian, Greek, and Roman Empires. And, by the time we reach the Millennial Reign of Christ, there will be nothing left of these once mighty kingdoms. Daniel discloses the fate of kings and kingdoms aligned against Israel and God himself in the last days: “During the reigns of those kings, the God of heaven will set up a kingdom that will never be destroyed or conquered. 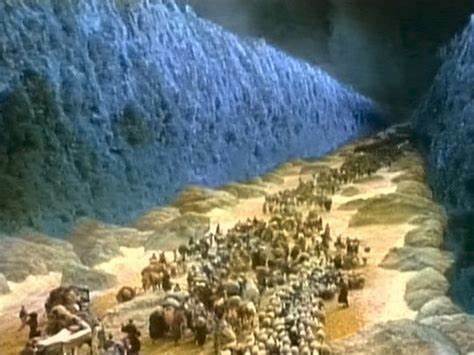 It will crush all these kingdoms into nothingness, and it will stand forever” (Daniel 2:44). In keeping with God’s sets of twos in Scripture for added emphasis to contrast, correlate, or in this case to combine and clarify, He reveals the four Gentile kingdoms as different beasts (instead of a four-part statue). This time the revelation is given directly to Daniel because he was a Jewish prophet and the vision pertains primarily to Israel (Daniel Chapter 7). You remember: First beast like a lion—Babylon; second beast like a bear—Persia; third like a leopard—Greece. With each of these images enhanced by other features that provide more proof of the (prophetic) identity of these nations, now known via historical hindsight. Such as the leopard with four wings and four heads. And, of course, the fourth beast which is greater and more terrifying than the first three; so much so that this beast couldn’t even be equated to an animal that we would understand symbolically. None other than the mightiest kingdom ever—the Roman Empire. More dramatic details were provided to Daniel in 551 B.C. (Chapter 8) while the Babylonian Empire was still intact (conquered by Persia in 539 B.C.) concerning two of these coming kingdoms. In fact, they’re even named: Mede-Persia represented by the two-horned ram and Greece, represented by the one-horned goat. The historical fulfillment is unmistakable. “The shaggy male goat represents the king of Greece, and the large horn between his eyes represents the first king of the Greek Empire. The four prominent horns that replaced the one large horn show that the Greek Empire will break into four kingdoms, but none as great as the first” (Daniel 8:21-22). That’s precisely what happened when Alexander’s massive kingdom divided into four regions after his abrupt and unexpected death. The remainder of Daniel Chapter 8 highlights the rise of the greatest of these kings from the four derivative kingdoms … historically identified as Antiochus IV Epiphanes. Then, as we shall soon see, the longest and perhaps most detailed prophetic chapter in Daniel (Chapter 11) foretells the political maneuverings and military adventures of two of these four post-Alexander kingdoms and kings, with the emphasis once again on Antiochus IV. Then, the last part of that chapter suddenly switches the spotlight to another ruler even greater … the Antichrist. Let’s return briefly to Daniel Chapter 7, which is the first introduction to the Antichrist by one of his other designations … little horn and king. With other labels given as the beast-king (Revelation 13 & 17); man of lawlessness (II Thessalonians 2); and, of course, by the term used most often—Antichrist, as found only in the Apostle John’s first epistle. In Daniel 9:26-27, he is referred to as a ruler whose armies would destroy Jerusalem and the Temple. After describing the little horn’s appearance as “sudden” and “different” in contrast to the ten kings who will yield their authority to him, Daniel Chapter 7 focuses on the little horn’s interaction with Israel (later amplified by the passage in Daniel 9). “As I watched, this horn was waging war against God’s holy people and was defeating them, until the Ancient One—the Most High—came and judged in favor of his holy people… He will defy the Most High and oppress the holy people of the Most High. He will try to change their sacred festivals and laws, and they will be placed under his control for a time, times, and half a time (3 ½ years, as found again in Daniel 9, Revelation 12 & 13)” (Daniel 7:21-22 & 25, parenthesis mine). As indicated, Daniel is first given a prophecy of the Antichrist (little horn, king … Daniel 7, followed by more information in Daniel 9); then two years later a vision of another man who would be a forerunner—a prototype parallel as found in Chapter 8. Finally, in Chapter 11, these two men are paired together in an almost seamless succession, prefaced by another reference to the “mighty king” (Alexander the Great), whose, “…kingdom will be broken apart and divided into four parts…” (Daniel 11:4). Before we examine both Biblical and secular records of these two profane peas in a pod as the (sordid) tenth set of significant twos in the Bible, did you know that this revelation (Daniel Chapter 11) was not given by the angel Gabriel … as with some of Daniel’s visions. Rather, it was revealed directly by Messiah Jesus in one of his Pre-Incarnate appearances to Daniel and others throughout the Old Testament. Writes Daniel: “On April 23 (536 B.C. ), as I was standing on the bank of the great Tigris River, I looked up and saw a man dressed in linen clothing, with a belt of pure gold around his waist. His body looked like a precious gem. His face flashed like lightning, and his eyes flamed like torches. His arms and feet shone like polished bronze, and his voice roared like a vast multitude of people” (Daniel 10:4-6, parenthesis mine; then the vision’s interpretation begins in Chapter 11). (*Note: Compare this description to Messiah Jesus as recorded in Revelation Chapter 1. Also, see Eye of Prophecy article: Messiah’s Amazing Appearances Before He Was Born, posted 10-6-18). (1) Biblical comparisons of Antiochus IV to the Antichrist. (2) Historical parallels between Antiochus IV Epiphanes and Nero Caesar. (A) Because time/space doesn’t permit elaboration in today’s article and because the evidence has been thoroughly developed and documented in my 2nd book Out of the Abyss plus many of the 56 Eye of Prophecy articles to date in the Category of The Antichrist, I’ll simply repeat this part of the Premise. Which is: Nero is the little horn, ruler, king, man of lawlessness, beast … the Antichrist. (B) Therefore, we would expect and there should be historical evidence of similarities between Antiochus IV and Nero. Keeping in mind one dramatic difference. Antiochus IV is long gone and will never return. Not so with the Antichrist. Which is as Revelation 17 distinctly details to corroborate Daniel’s explanation: the little horn suddenly and differently appears (Daniel 7:8 & 24). “The beast you saw was once alive but isn’t now. And yet he will soon (meaning abruptly or suddenly) come up out of the bottomless pit… And the people who belong to this world … will be amazed at the reappearance of this beast who had died” (Revelation 17:8, parenthesis mine). *Note: What makes the little horn of Daniel 7 substantially different from the ten kings is that he had already died but would (re)appear suddenly (from the Abyss). The (four) features that we’ll examine in Part 1 (Biblical Comparisons) are what Antiochus IV did in his time compared to what Antichrist will do upon his Tribulation reappearance and reign. Both of which were future tense to Daniel. Then in Part 2, I’ll identify some remarkable resemblances between Antiochus IV of the 2nd century B.C. and Nero—as the man of lawlessness in the 1st century A.D., before his return as the Antichrist beast of Revelation (in the 21st century!). There is even a striking similarity in the lapse of time between Daniel’s vision as explained by Messiah Jesus to him in Chapter 11 (551 B.C.) and pinnacle of Alexander the Great’s kingdom (330 B.C. ), resulting in the subsequent division of his Grecian Empire into four lesser kingdoms. That period of 221 years is virtually identical to the period beginning with Antiochus’s demise (death) in 164 B.C. to the rise of Nero as Caesar in A.D. 54 (218 years). 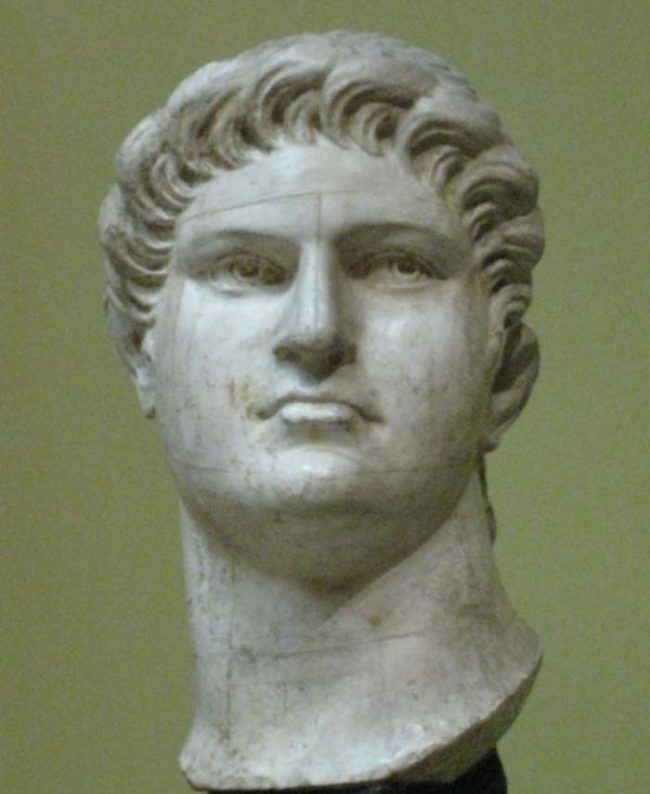 And, if we eliminate the first three years or so of Nero’s tenure, because he was more of a puppet ruler under the tutelage thumb of his mother Agrippina, we have 221 years (A.D. 57). – Rise and exploits of “a despicable man.” Which turned out to be Antiochus IV, who ruled from 175 to 164 B.C. (Verses 21-32). – Emergence of a greater king, i.e. Antichrist (Verses 36-45, end of the chapter). (A) Desecration of the Jewish Temples. This is one of the most well-known by students of the Bible and students of secular history (or those who are both, like yours truly); that Antiochus IV abolished (temporarily) Jewish rituals and desecrated the second Jewish Temple (Daniel 11:31-32). In like manner, the Antichrist will defile the third Jewish Temple during the Tribulation (Daniel 7:25 & 12:11; Matthew 24:15; II Thessalonians 2:4). (B) Their Rise to & Exercise of Power: Regarding Antiochus IV: “At the end of their rule (the four divided kingdoms of Alexander’s empire), when their sin is at its height, a fierce king, a master of intrigue, will rise to power. He will become very strong, but not by his own power. He will cause a shocking amount of destruction and succeed in everything he does. He will destroy powerful leaders and devastate the holy people. He will be a master of deception and will become arrogant…” (Daniel 8:23-25, parenthesis mine). And he will distribute wealth and plunder among his followers (Daniel 11:24). Like Antiochus, Antichrist’s (Nero) rise to prominence was neither the first time (1st century) nor will the second time (Tribulation) be “by his own power.” Instead, it will be a direct result of and based exclusively on his perceived miracle of returning from the grave (in realty, the Abyss … Revelation 17:7-8; Revelation 13:3-4). So, too, will Antichrist lavish expensive gifts and honor those who submit to him (Daniel 11:38-39). (C) Kings of the North: Both the “fierce king” (Antiochus IV) of Daniel 8 & 11 and Antichrist (Daniel 11) are labeled as the king of the north. This to contrast them to the king of the south, both of whom are enemies of Antiochus and (during the Tribulation) Antichrist, respectively. In history, Antiochus launched a final invasion against the king of the south (Ptolemaic king of Egypt) to put an end to the decade’s-long wars and broken treaties between predecessors of these two dynasties (Daniel 11:29). So, too, will the Antichrist, “…storm out” against a southern alliance (king of the south) invading “various lands” conquering many countries, but not all and some only partially (Daniel 11:40). In other words, not a complete victory, in similar fashion to Antiochus’s incomplete conquest of the king of the south. (D) Sudden Threat from Other Coalitions/Countries: “Then at the time of the end (last few months of the seven-year Tribulation), the king of the south will attack the king of the north…” (Daniel 11:40, parenthesis mine). In furious response, the king of the north (Antichrist) will invade the lands of the southern coalition, sweeping through them like a flood, entering the glorious land of Israel, conquering many countries, even Egypt (Verses 40-43). But Antichrist is stopped cold in his rampage through the Middle East. We read: “But then news from the east and the north will alarm him, and he will set out in great anger to destroy and obliterate many. He will stop between the glorious holy mountain and the sea (Megiddo in the Valley of Jezreel) and will pitch his royal tents. But while he is there, his time will suddenly run out, and no one will help him (Armageddon)” (Daniel 11:44-45, parenthesis mine). In a remarkable precursor manner, we see Daniel’s intermediate future prophecy (as opposed to the end-times) regarding the first King of the North (Antiochus IV). He, too, invaded the southern kingdom (Ptolemy … Egypt). He, too, launched a campaign against Israel. We read: “Then at the appointed time he will once again invade the south, but this time the result will be different. For warships from western coastlands will scare him off, and he will withdraw and return home. But he will vent his anger against the people of the holy covenant and reward those who forsake the covenant” (Daniel 11:29-30). Then in verses 31-32, we read about the desecration of the 2nd Temple, including setting up the sacrilegious object, which took place in 167 B.C. Thus, Antiochus IV invaded Israel and unleashed his fury on the Jews not long before his brutal exploits came to an end, but only after being threatened by other armies. Likewise, Antichrist (Nero) will invade Israel near the end of his allotted period of power and authority; also, infuriated after hearing news of enemies gathering against him (kings of the east … Revelation 16). Although there are a few other similarities, the preceding four comparisons are the most notable between Daniel’s prophecy of the first king of the north—Antiochus IV, then the second (end times as Daniel states) king of the north—Antichrist. As intimated in the previous Eye of Prophecy article, the primary purpose for some of the monumental plans of the Lord taking place in sets of twos is that of contrast, correlation, combination and/or culmination. Another word comes to mind: Preparation. Such as the First (Old) Covenant a preliminary pattern for the Second (New) Covenant. Likewise, with both kings of the north in the historical and future context of preparing the Jews left behind at the Rapture. Which, unfortunately, will be most of them, as there are relatively few Messianic Jews compared to the total population of Jews in today’s world. 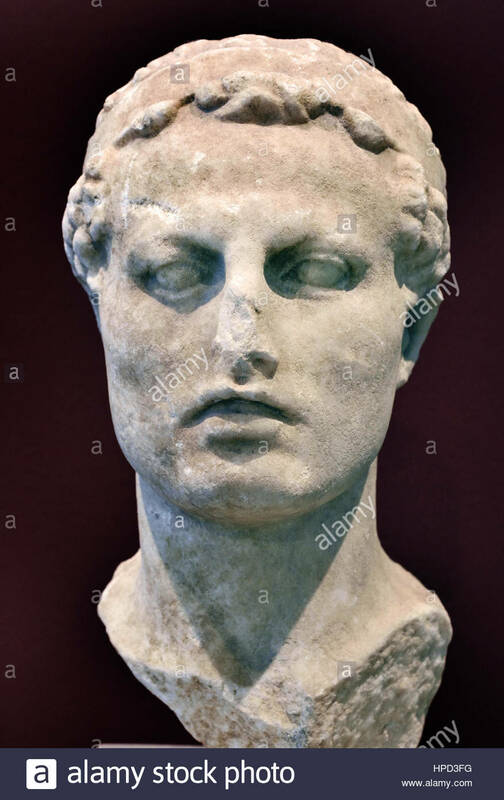 Just as Antiochus IV initially appealed to many Jews of that time who wanted to Hellenize Judaism and globalize the Jewish culture alongside and even into Gentile societies; so, will Antichrist (Nero) at the outset be welcomed by most Jews. First and foremost because (along with Gentiles the world over) of Nero’s stunning reappearance itself. Although many will not accept him as Messiah (because he’s not Jewish), they will eagerly agree to his 7-year treaty that will include permission to rebuild the Jewish Temple. See Eye of Prophecy article: Two State Solution & The Seven Year Treaty … Impossible? Posted 1-26-19. And like Antiochus IV, the Antichrist will suddenly turn on the Jews, break the treaty, and begin his conquest of Israel and Jerusalem. This conquest will be slowed by two main factors: (1) Enemies of Antichrist’s coalition; (2) Massive natural disasters via the trumpet and bowl judgments directly from God, some of which affect only Antichrist and his realm. This will all be possible because then, as now, most Jews will still not acknowledge Jesus as their true Messiah. Instead, they will yield to the false messiah (Antichrist) until they fully realize that they were wrong. Sadly, they will again not learn the lesson of the first of two men (Antiochus IV) who profaned the Temple and who attempted to eliminate Jewish identity and culture. But that took place under the Old Covenant; thus, the Lord raised up a group of men to deliver the Jews and restore (partially) Israel’s national sovereignty—preparing the way for the New Covenant. In today’s world there are as many or more Jews who celebrate Hanukkah than even some of the Biblical mandated festivals, such as Yom Kippur. Reason: there are far more non-religious Jews than the observant (especially the Orthodox) among them. This festive holiday takes place in the Gregorian calendar month of November or December. 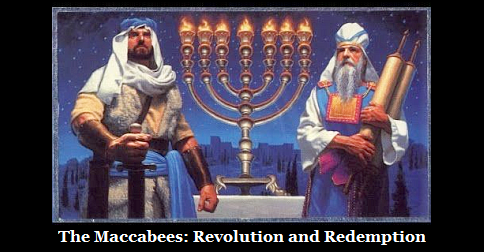 It commemorates two miracles: (1) victory of the Maccabees over the vastly superior forces of Antiochus IV; (2) one-day supply of the anointed Menorah oil that lasted eight days. So, too, will Israel and Jews world-wide experience a final time of peril when the second man (in this unholy set of twos) bursts on the scene, having returned from the Abyss. Israel will not have learned the lesson that, like his prototype predecessor Antiochus IV, Nero (called anti-Christ because this time the event will occur under the current New Covenant), will also deceive the Jews (and many Gentiles) with promises of global peace and prosperity. Just as Antiochus IV attempted to persuade (through flattery … Daniel 11:21) the Jews of his time to accept the Greek culture as superior. As indicated earlier in the two-part premise: (B) Therefore, we would expect and there should be historical evidence of similarities between Antiochus IV and Nero. Most professionals like doctors, lawyers, craftsmen, businessmen and women—are specialists in their field, such as cardiology. So, too, are most historians … concentrating on specific periods of history, e.g. American Civil War or the European Renaissance. Others, like me, are general historians; however, I have focused years of research and study on 1st century (A.D.) church and secular history plus 20th & 21st century events. Although I’ve read much of that written about Antiochus IV, I’ve read virtually every historical and several contemporary writings about Nero. I bring this up to offer an observation that fits with the above premise: I know of no other well-known ruler, other than Nero, whose reign contained several of the same aspects as that of Antiochus IV. Which further corroborates that Nero is (the) anti-Christ in the same vein that Antiochus was anti-God (against the God of Abraham, Isaac, and Jacob) and that Antiochus IV is directly linked to the Antichrist as clearly conveyed in the book of Daniel. As we examined four Biblical comparisons between Antiochus and the (Tribulation) Antichrist, we’ll also look at four parallels between Antiochus and Nero, during Nero’s first revealing as Antichrist in the first century. Nero took it step further; he declared that he was both God and Savior (for all mankind). Both had coins minted with these divine epithets. On the flip side of this egotistical emphasis of their divinity, each of them wanted desperately to be popular, especially with the common people. Both mingled with the populace, appearing frequently in public places. (B) Devotees to/of the Universal Greek Culture: Although Rome had already achieved the pinnacle of greatness during Nero’s tenure as Caesar, Greek culture still permeated every aspect of Roman society, indeed much of the civilized world. As English is considered the universal language of today’s world, so the Greek language was supreme during the times of Antiochus and Nero. It was the Greek-speaking Seleucid Antiochus’s attempt to Hellenize the Jews that led to his outburst of rage when the Jews resisted his loyalty to all that was Greek; leading to his ruthless attack on Israel that resulted in the death of 40,000 Jews and enslavement of 40,000 more. So, too, was Nero enthusiastically enthralled with and ardently absorbed in many things Greek. In fact, it was his journey to Greece for well over a year during the last part of his reign (including writing and performing of Greek plays) that led to his downfall. The Roman Senate didn’t take kindly to their Emperor debasing himself on the stage. No other Roman Emperor or ruler of any other non-Greek nation possessed and expressed such passion for the Greek culture as did Nero. 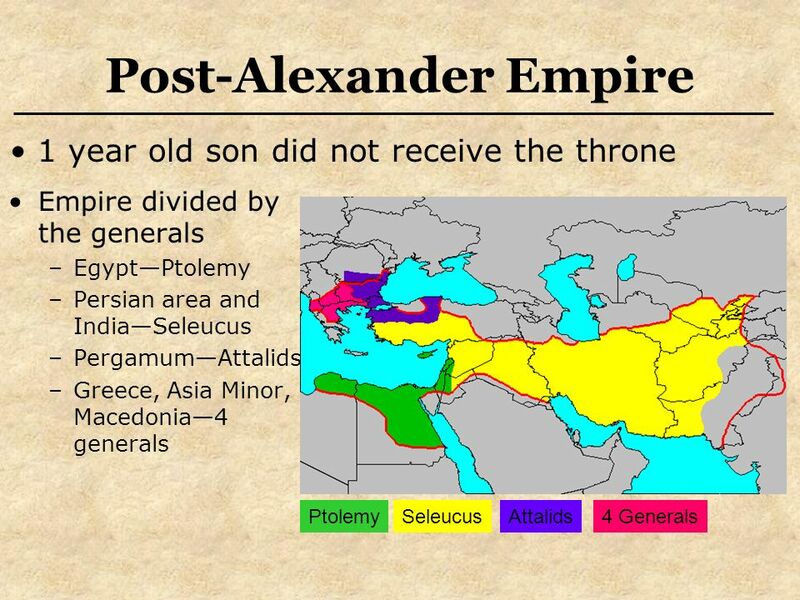 (C) Both Are the Eighth King & Arose to Power Illegally: Antiochus IV was the 8th in a succession of twenty-six kings that ruled the Seleucid Dynasty … the Syrian segment of Alexander’s divided empire. Although Nero was the fifth Roman Caesar, when revealing the mystery of the beast (tantamount to revealing the identity of the beast as a man who had already lived and died but would return from the Abyss) the angel also told John: “This calls for a mind with understanding. The seven heads of the beast represent the seven hills where the woman rules (Rome). They also represent seven kings. Five kings have already fallen, the sixth now reigns, and the seventh is yet to come, but his reign will be brief. The scarlet beast that was, but is no longer, is the eighth king. He is like (Greek word, “Ek”, which means one of or out of) the other seven…” (Revelation 17:9-11). Nero was one of the five already fallen (dead) kings. But he would—when combined with all the other passages on the Antichrist, including the number of the beast in Revelation 13 which matches up through Hebrew gematria with Nero Caesar—then be the 8th king … upon his return from the Abyss. Both Antiochus IV and Nero ascended the throne without being in the immediate line of succession. And not long afterward, each murdered a rival heir to the throne to make sure there would be no subsequent competition. Time and space do not permit more details. (D) Length of Time of Antiochus’s Reign Corresponding with Nero’s: Antiochus IV ruled from 175 B.C. to his death in 164 B.C., a total of eleven years. Although Nero technically reigned fourteen years (A.D. 54 to A.D. 68), only eleven of those years was he exclusively in control of the throne. 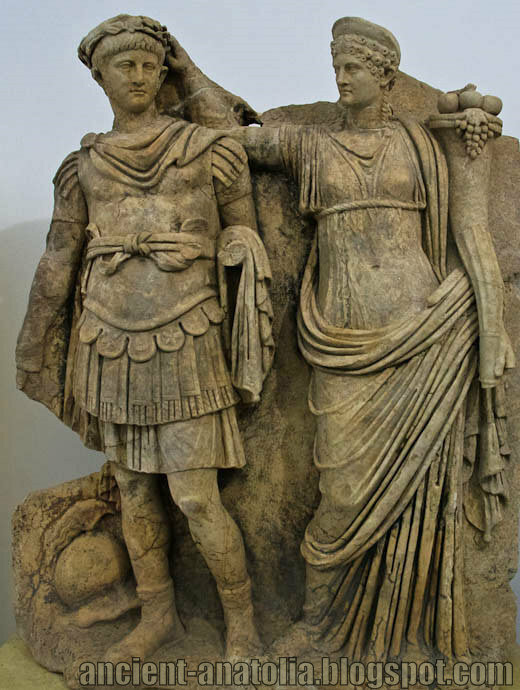 The reason: his mother, Agrippina, who not only murdered her husband (Emperor Claudius) to make way for Nero to become Caesar, but also dominated the Roman political scene for the better part of three years, until Nero banished her from the royal court. Subsequently, he had his mother murdered in A.D. 59 … on the charge of treason! Hence, the evidence shows that both rulers exercised autonomous rule for eleven years. Even more startling is the almost exact span of time that the rule of both tyrants incorporated a reign of terror. No less, than the same amount of time that God will allow Antichrist to exercise the peak of his power and authority during the Tribulation (Revelation 13:5). That time: 3 ½ years! During Nero’s first stint as Antichrist, for the last 3 ½ years (A.D. 64 through his death in June, A.D. 68). You may recall historically that Nero (falsely) blamed the Christians for the great fire in Rome of A.D. 64. Soon, thereafter, he began to persecute and kill Christians on a massive scale. Then, he launched a campaign against Israel in A.D. 66 that also took about 3 ½ years for his generals and legions to complete. In and immediately surrounding Rome itself Nero’s venom was directed toward Christians; however, at that time most Christians were (Messianic) Jews … Jewish Christians. And don’t forget that Christ Jesus’s ministry lasted for about 3 ½ years! God will allow the Antichrist (Nero) the same period to (a second time vainly and unsuccessfully) prove that he is both God and Messiah. So, too, did Antiochus’s reign of terror against the Jews last for 3 ½ years. From the outset when he began to invade Israel and persecute the Jews in 168-167 B.C. to the time when the Maccabees defeated his Syrian-Greek armies in 164 B.C, followed by his death soon thereafter. There are other parallels, such as the interaction of both Antiochus IV and Nero in their respective times with the nation of Parthia. However, these four comparisons sufficiently show that the two were as similar as anything or anyone could be—considering that they were separated by 200 years … from the death of Antiochus to the birth of Nero. Moreover, Antiochus died in the month of December, the same month in which Nero was born. Thus, there is not only a Biblical prophetic parallel concerning Antiochus IV and the Antichrist, but also historical documentation to demonstrate a counterpart match between Nero and his prototype predecessor, Antiochus IV. The entire Word of God is marvelous; including the breathtaking scope (breadth and depth) of Biblical prophecies. Prophecies coming to pass days, years, decades, centuries, and even millennia later. Some fulfilled with precise length of time and actual dates prophesied (See Eye of Prophecy articles: Extraordinary Biblical Prophecies w/Predicted Times of Fulfillment, Part I & II, posted 3-2 & 3-9-19). Others that include specific numbers, particularly the number seven. Still others that combine two people or events in significant sets of twos. Even including two detestable despots who, when all was/is said and done, have served and will serve God’s powerful purpose and accomplish his providential plan for Israel and for believers in the true Messiah Jesus—Jew and Gentile alike. Though all people immediately left behind at the Rapture will be unsaved, there will soon be millions who will know what’s happened and why. Among these will be 144,000 Messianic Jews who will be mighty witnesses (Revelation Chapters 7 & 14) for Messiah Jesus and lead millions to him, despite horrendous persecution and death. Throughout the seven-year tribulation (particularly the first half) more and more people will choose Christ over Antichrist. Especially, considering their proportion of the left-behind world’s population, the Jews—both in and outside of Israel. However, tribulation saints, both Jew and Gentile, will still be greatly outnumbered by unbelievers. At the very end of this horrific time of turmoil, Jesus Christ will return to set all things right. 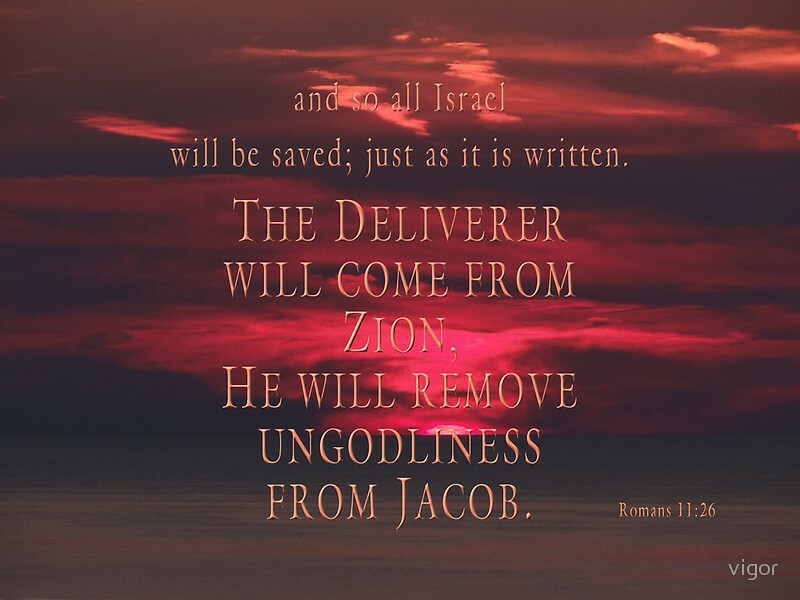 He will easily defeat the unholy trinity of Satan, Antichrist, and the False Prophet, followed by a crushing blow to those nations and armies who would dare to invade Israel and who would defy the King of all kings. All to prepare the earth for Messiah’s glorious Millennial Reign. The Kingdom of God on earth! For since their rejection meant that God offered salvation to the rest of the world, their acceptance will be even more wonderful. It will be life for those who were dead!” (Romans 11:15). “For everything comes from him and exists by his power and is intended for his glory. All glory to him forever! Amen” (Romans 11:36).